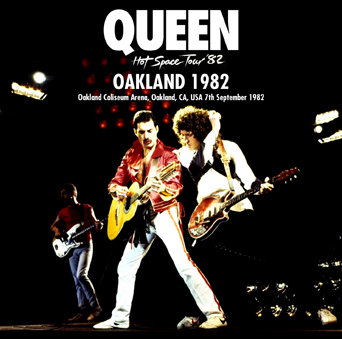 Recorded: Live at Oakland Coliseum Arena, Oakland, CA, USA 7th September 1982. Sound: Audience recording. (Claimed to be in perfect sound). Comments: I'm a Queen fan & collector since the seventies. I have not found any recording from this concert, which contains more tracks than this bootleg cdr. So I guess so far, only one tape recording has seen daylight. I don't have this bootleg cdr, so I'm not sure of the sound quality, or which generation Uxbridge has used. Incomplete recording. Missing the end part with 'We Will Rock You' & 'We Are The Champions'. Anyway, looks like a nice release with nice cover & correct year of picture. From the US 'Hot Space Tour 1982'. This was the last US tour Queen did with Freddie. This concert has previously been released by BREAKDOWN label in December 2005, with title Hot America On Fire 2cdr.